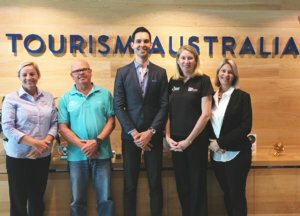 Last week, the three regions of Capricorn, Gladstone and Bundaberg again partnered to promote the Southern Great Barrier Reef (SGBR) Destination to Sydney ITO’s (Inbound Tour Operators). 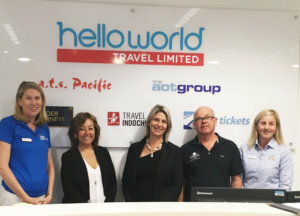 Capricorn Enterprise CEO, Mary Carroll, led a delegation of operators new to trade over three days of very successful appointments held with Goway Travel, All Pacific Travel Concept (APTC), ATS Pacific, Pan Pacific Travel, Pacific Destinations, and Tourism Australia. Southern Great Barrier Reef RTOs have been conducting important annual tourism trade sales calls and training meetings with key Sydney international partners for 7 years now, resulting in strong relationships and understanding of our destination and key tourism operators. This forms only a part of our operator mentoring strategy which also includes one on one mentoring programs critical to growing operator contracts with ITOs, Wholesalers and Retail Agents across the globe. Congratulations also go out to a group of leading Capricorn tourism businesses who have either previously, or are currently, participating in our mentoring program. This year they are conducting their own Sydney sales mission for the first time ever in a couple of weeks. Capricorn Caves, Great Keppel Island Hideaway, Yeppoon Accommodation (Salt, Echelon, Beaches on Lammermoor), and Cassidy Group (Empire, Edge), are going from strength to strength selling our Capricorn precinct of the Southern Great Barrier Reef and their products. Not only is this an investment in growing their businesses, but also the region. Recently, SGBR RTOs participated in Corroboree West, as well as Great Keppel Island Hideaway, Kellys Beach Resort and Lady Elliot Island attending last week’s German Aussie Specialist workshop. Each of the RTOs have invested in trade mentoring again this year, with operators working with our specialist contractor to learn how to grow their participation in trade programs. For Capricorn these operators are: Yeppoon Accom, Great Keppel Island Hideaway, Pumpkin Island, Capricorn Caves and Freedom Fast Cats. A number of these are well and truly working internationally, with mentoring delivering an extension of their participation and new sales and training tools. Capricorn Enterprise, on behalf of SGBR has also been invited to present at the Best of Travel Group (BOTG) brochure launch and training workshop in Dusseldorf in December. This will include 11 BOTG members, with 22 offices, and approximately 100 participants. Additional itinerary and appointments with key Wholesalers, Product Managers, and Retail Stores have been included to extend the benefit of the business trip. Appointments are almost completely booked in with: Best of Travel Group, Explorer Fernreisen, Boomerang Reisen, Dertour, Meiers Fernreisen, Tourism Australia, AOT/FTI, Pacific Island Travel, Studiosus, Australia Plus Reisen, Tourism and Events Queensland, Kiwi Tours. German industry are very excited to see SGBR taking this next step in market, with this being our first ever solo sale mission in market. « 2017 CAPRICORNIA BUSINESS AWARDS!